Before Pope John Paul II (now Saint John Paul II) was due to visit Denver, architect David Tryba contacted Agrell Architectural Carving with an idea for a custom wood carved throne. He visualised a simple seat that combined the majesty of the Rocky Mountains with the natural beauty of the state of Colorado. We suggested using the Columbine, Colorado's state flower as the central decorative motif. The hand-stitched seat back and cushion were fashioned by the same talented group of artisans with whom we had worked on the Cathedral of the Madeleine in Salt Lake City. A hand-carved dedication was also incorporated into the design, and we created two smaller side chairs to complement the throne. We understand that these pieces are now on display in the Cathedral in Denver. 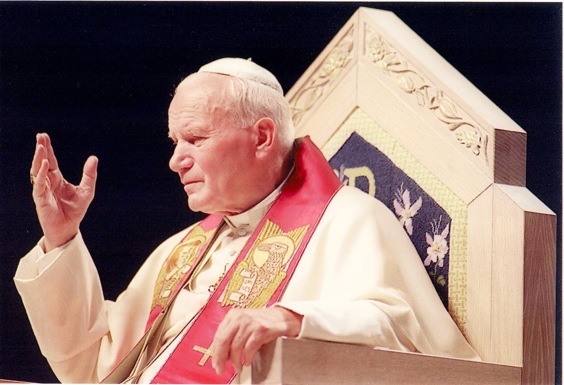 "...the incredible effort you and your talented staff put forth in the chair for his Holiness Pope John Paul II...was well beyond our expectations. Thank you again for your enthusiasm, fantastic talent, hard work and the devotion you brought to our project."